The problem with Napa’s Downtown Trolley isn’t that a trolley is not a good idea. It’s that Napa doesn’t actually have a trolley. People can ride phony trolleys in tourist towns all over the country. Big deal. What they actually like are real trolleys. Whatever you call them—trolleys, streetcars or trams—they’re those things that run on rails but are not trains or rapid transit systems like BART. San Francisco, California Trolleys, for example, are used with great success in San Francisco on the F Line along Market Street and the Embarcadero, and on the E Line to the Caltrain Depot at Mission Bay. 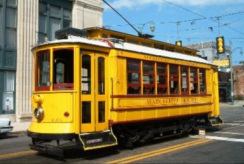 San Francisco has been buying used historic trolleys from cities (even from the “Desire” streetcar line in New Orleans) all over the world for more than 25 years. It now has 20 of them. And residents and tourists love them. Why? Because trolleys are fun. Buses, even the ones we try to disguise as trolleys, aren’t. Here are some examples of successful trolley systems in North America. The Old Pueblo Trolley includes streetcars that originally operated in Japan, Belgium, Canada and Portugal. They connect the University of Arizona with downtown Tucson, and the city is planning to expand the routes. The trolleys currently run Friday evenings, Saturdays and Sundays. Adult fares are $1.50 on Friday and Saturday, and 25 cents on Sundays. Nelson, B.C. You don’t have to be a big city to have a successfully trolley. Nelson, B.C. has one. Never heard of Nelson? It’s on Kootenay Lake in the Selkirk Mountains in southern British Columbia in Canada. Nelson’s main trolley is called “Streetcar 23″, built in 1906. It runs two miles along the lakeside waterfront, and is popular with both tourists and locals. Nelson also has a second streetcar, No. 400, built in 1921. The trolley runs only from April to October (unlike Napa, it snows a lot in the winter, and although skiers come, tourism numbers overall drop a lot). It makes its trips for about six hours every day during the summer, and runs only on weekends during the spring and fall. On Steetcar 23 adult fare is $3, seniors and children (6-12) are $2, and under 6 with an adult is free. The maximum fare for a family is $8. A season pass is $25 for one adult and $15.00 for a senior or youth. Family season passes are $50.00, adult $25, seniors and youths $15. Passengers wishing to board at one location and leave prior to completing a full round trip can obtain a ticket from the conductor and re-board on a later trip to complete their journey. The streetcars can also be booked by conventions, tour groups and other organizations when not in use on their regular route. Cost is $75 per hour. The initial cost of the Nelson Streetcar system in 1980 was $1.5 million. One million came as a grant from the British Columbia provincial government, and the other $.5 million from donations and fundraising events. Canadian Pacific Railway donated tracks and ties, and railway employees donated their time to lay the tracks. The electric system was supplied and installed by West Kootenay Power & Light as a charitable tax donation. The Nelson Chamber of Commerce was one of the prime movers behind the establishment of the trolley. The streetcar system is owned by the non-profit Nelson Electric Tramway Society, and there are no paid personnel. The system is run by more than 65 volunteers, including motormen (and motorwomen), conductors, maintenance, electrical and track repair people. Annual ridership is 10-20,000 and cost of operation is around $25,000, which includes $8,000 liability insurance. The City of Nelson donates the electric power, which costs around $700 per year. Local residents make up about 15% of the ridership, the rest are tourists, regional residents and charters. Farebox—that’s the amount riders pay in fares—brings in between $18,000 and $20,000 each year. There are at least 12 charters per year, and usually four or five weddings at the same $75/hour price. The system collects $7,000 a year from car advertising, and donations add still more. The city considers the streetcar to be very successful in bringing tourists from all over the world. Because of the streetcar’s success, the community is discussing expanding its route to other areas of the town. Astoria, Oregon Astoria, Oregon, with a population of 10,000, has had its Riverfront Trolley since 1999. It runs seven days a week during the summer and only on weekends during the off-season. Fare is $1 for anyone old enough to occupy a seat, and you can stay on as long as you want. A $2 fare will get you get off and on all day long. Charter the entire trolley for $100/hour. Average round trip is 40 minutes for the three-mile ride. The Riverfront Trolley carried close to 60,000 passengers in 2005. El Reno, Oklahoma El Reno is about 30 miles west of Oklahoma City. It has a population of 15,000. That’s about one-fifth of Napa’s population. El Reno has run the Heritage Express Trolley since 2001. The trolley travels 0.9 miles connecting the local historical museum with the downtown shopping area. Total trip time is about a half hour. Tickets are good for four rides and cost $3.00. Galveston, Texas Galveston has a population of 58,000. Since 1988 the city has been running a trolley over a service area that now covers six miles with two routes, and another extension is in the planning stages. Fares are $1.25 for adults and $0.65 for all other categories. Frequency for one route is every 15 minutes, while the other runs at 20 minute intervals. Kenosha, Wisconsin Kenosha has 96,000 residents and is located on Lake Michigan a little north of the Illinois/Michigan border. The city operates a two-mile streetcar loop which connects the local commuter rail station to downtown attractions, a transit center, and a new 64-acre residential development situated on the Lake Michigan shore. Daily service is provided using one of five refurbished cars, each painted in a different color scheme. The entire project, including a new maintenance building, was completed in 2000 for $5.2 million (about $3.5 million per mile in today’s dollars). Operating hours vary by season, with a shorter schedule provided during the winter months. Fare is 25 cents. All five cars have onboard wheelchair lifts. A Real Trolley for Napa Why not get a real trolley for Napa like the one in Nelson? Or in El Reno, Astoria or Galveston? Or the one in Kenosha? It’s estimated that the initial $5.2 million investment in Kenosha’s trolley has resulted in $150 million in development investment directly related to the trolley line. Funding for similar systems is available through the U.S. Department of Transportation’s Small Starts Program, as well as through other programs and sources. Having an electrified heritage trolley (maybe more than one since there are currently three “trolleys” being used in Napa) running on rails through downtown and Old Town Napa would be a big tourist draw, and an attractive method of transit for locals. The original intent of the trolley when it was launched in 2002 was to move tourists from the outlets to downtown. However, with the recognition that the primary users were local residents, the city turned the trolley over to the Napa County Transportation Planning Agency and it was integrated into the entire countywide bus system. The Napa Downtown Association currently pays 16% of total costs, or about $55,000 of the $325,000 annual operating costs. Since merchants cover the “farebox”, there is no charge to passengers. While the trolley, with a ridership of 55,000 a year, averages only 11 passengers per hour, that’s still better than three of the city’s other seven regular bus routes. And the seemingly low per hour figure may say more about the problems of transit in a town like Napa than it does about the trolley itself. Overall, the trolley is quite successful as local transportation. But it could be much, much more. Electrifying the trolley makes sense in this time of increasing oil prices and decreasing oil availability. Electricity is the preferred method of locomotion for trams and trains all over the world. Using “heritage” trolleys rather than sleek, modern ones is more appealing to tourists and more appropriate for a trolley route through the Victorians in older parts of Napa. I propose that we design the trolley route roughly where the current Downtown Trolley goes. But be sure to design it such that it could be expanded in the future, perhaps connecting to the Trancas shopping corridor as well as to the eventually-to-be-rejuvenated Riverpark Shopping Center on Imola. Maybe even out to Napa Valley College at some time in the future, which could help with the parking problem out there. Further in the future? How about to the Napa Valley Corporate Park, the Meritage Resort and the Napa Pipe area? But, you might ask, don’t trolleys just get in the way of real transportation? (By that you probably mean Hummers, SUVs, pickups, and those quaint things called cars that some people still drive.) Actually, no. Experience has shown that trolleys and other vehicles, including automobiles of all sizes, buses and trucks, can co-exist quite well. If you’ve been to Europe, you’ve seen that even bicycles can easily and safely share a street with trolleys. In this country, a visit to Portland will show you the same thing. Using a real trolley in Napa would also serve as a proof-of-concept. If it works well in Napa, why not run it up to Yountville? Run it along Solano Avenue (but first run track over the Trancas overpass) traveling to California Drive and the Veterans Home entrance. Or, as the Wine Train has long desired, use not a trolley but a self-propelled “railbus” to go from downtown Napa to Yountville. Does this sound like a radical idea? It wasn’t radical in the early part of the last century. Interurban passenger railcars ran regularly until 1937 all the way from Calistoga down to Vallejo. Car No. 62 (and its sister car No. 63, now at the Western Railway Museum in Suisun City) had enclosed platforms on both ends, a smoking compartment, a toilet compartment, a main passenger compartment, and a baggage room. Lots of room for today’s tourists to bring back cases of wine from their upvalley sojourns. An electric heritage trolley in the city of Napa isn’t an idea whose time has come. The idea came some time ago. Let’s just do it right. Let’s save energy, lessen downtown traffic, decrease air pollution, decrease the need for parking, and in this time of ever-increasing competition for tourists, attract more visitors to our downtown area. And make it more fun for ourselves, as well. Streetcar Myths Myth: Overhead wires will be an eyesore. Fact: Streetcars use a single overhead wire 1/2 inch in diameter. Myth: Bikes and streetcars don’t mix. Fact: Portland and Philadelphia are bicycle-friendly cities; we can learn from them how to integrate streetcars and bikes. Myth: Streetcars will harm bus service. Fact: Buses replaced by streetcars can be used to provide new and expanded services. Streetcars can increase overall transit ridership. Myth: People who don’t ride buses won’t ride streetcars. Fact: In San Francisco, 7,000 people/day rode the electric bus; 21,000 people/day rode a streetcar on the same route. Myth: Streetcars are more expensive to operate than buses. Fact: There are trade-offs; buses last only 8 years, streetcars last 40 years. Myth: Streetcars are too slow to attract riders. Fact: Streetcars are designed to provide convenient, accessible, comfortable transportation. Myth: Streetcars won’t reduce car trips. Fact: They will reduce short, wasteful car trips within the area they serve by providing a predictable, comfortable alternative. Myth: Fixed tracks make streetcars less flexible, and therefore a waste of money. Fact: Building a permanent infrastructure for streetcars encourages retail and residential development. Buses do not. Thanks to Downtown Trolley, Inc. of Madison, Wisconsin for the above myth information. Specializing in both the technical and historical aspects of vintage railway equipment and operation.